Aster Wartburg Star Aster Tongolensis is a perennial aster that belongs to the Asteraceae family. Also called East Indies Aster, this perennial can be grown from seeds, and it grows fast reaching 24 inches in height. Wartburg Aster has bushy, mat-forming, dark-green foliage with hairy, elliptic shaped leaves. Aster Tongolensis produces very showy, large 2 1/2 inch in diameter, lavender-blue flowers with orange-yellow centers. This perennial aster blooms first year from Early Summer to Mid-Summer, and its flowers attract bees and butterflies. Aster Wartburg Star is excellent for rock gardens, edging, mass planting, and containers. East Indies Aster is easy to grow, low maintenance, long-lived perennial flower, and its showy presence is noticeable in a garden. 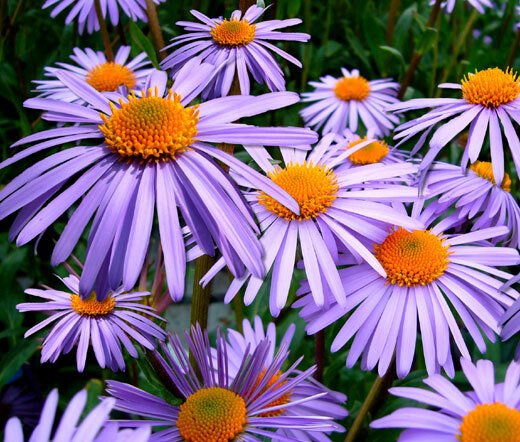 Aster Tongolensis grows best in full sun or partial shade, and prefers moist, but well-drained soil. Wartburg Aster makes a superb cut flower.